Access Content > Elements. 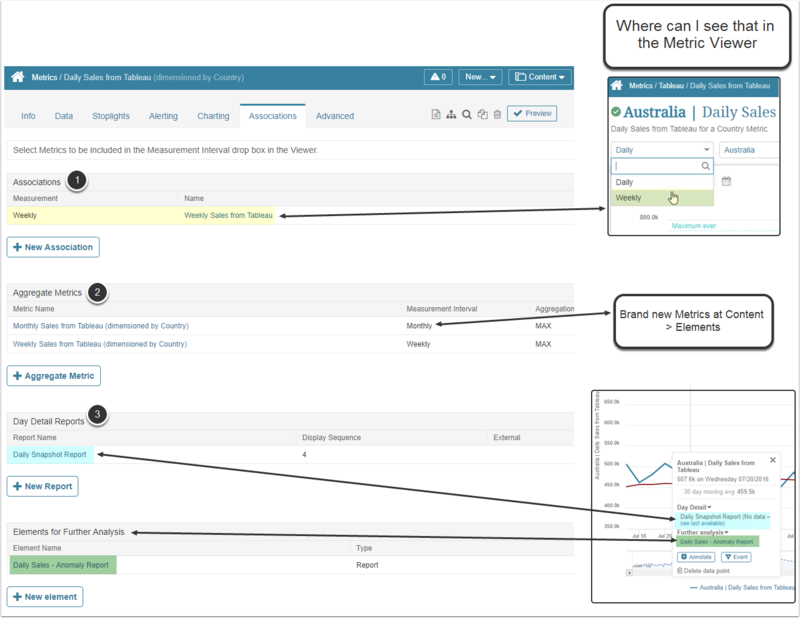 The list of all types of elements available in Metric Insights is going to be opened. Filter the elements by keywords and other available parameters. Find the element in the refined list and click its name. You are going to be redirected right to the editor. Collecting is: This setting defines whether this Metric is "active" and whether it is going to be updated upon a schedule set up in a Data > Data Collection Trigger. Make visible on Homepage: Define whether this Metric should be accessible via a tile on a Homepage or only at Content > Elements or via other element's Associations. This page is dynamic and it is going to have a different set of options depending on the selected Data Source. 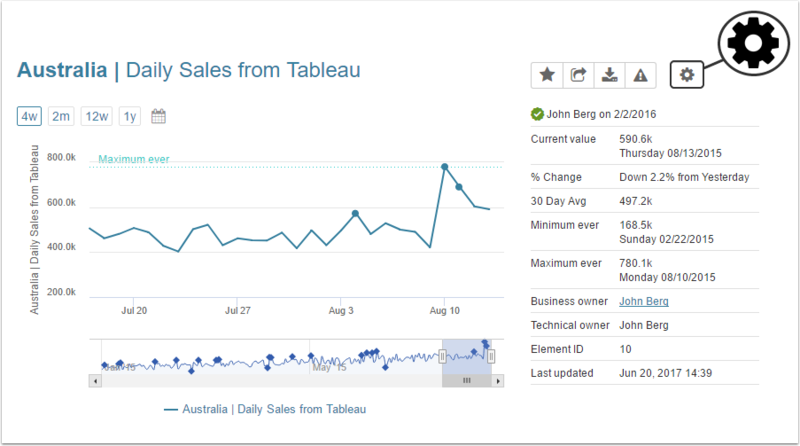 The given example is for the Metric built from a configurable Data Source (Plugin - Tableau). 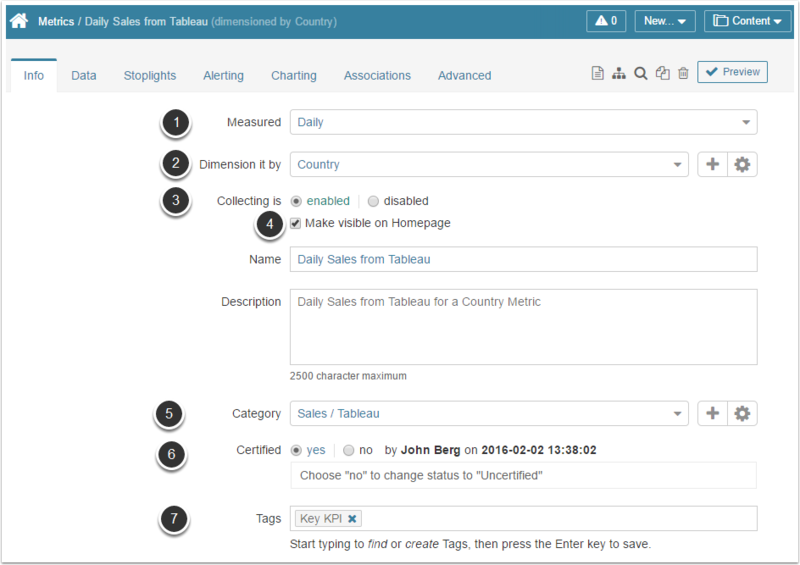 Tableau Worksheet (This field is specific to the selected Plugin Data Source): When a Metric is sourced from a Plugin, this field is named with respect to how elements are called in a source system. The given example is for a Tableau and elements in Tableau are called "Worksheets"; for other systems, this can be called a "Report", an "Object", etc. The main function of this field is to map Metric Insights to a specific element in the source system, so this is a so-called "path" for the systems with a multi-level hierarchy. Command (is applicable for configurable Data Sources: SQL or Plugin): Data for Metrics is extracted via a plugin command, consisting of parameters specifying what data should be fetched. The command can be entered manually or via the Visual Editor (if a plugin supports it). Values are additive across time periods: field will be set to 'yes' if, for example, the daily values can be aggregated to create weekly and monthly values. Omit current <Measurement Interval> from Chart: This setting depends on the Measurement Interval chosen for this Metric (day/month/year). If you set this field to 'yes', current day/month/year etc. is not going to be displayed on the Chart. 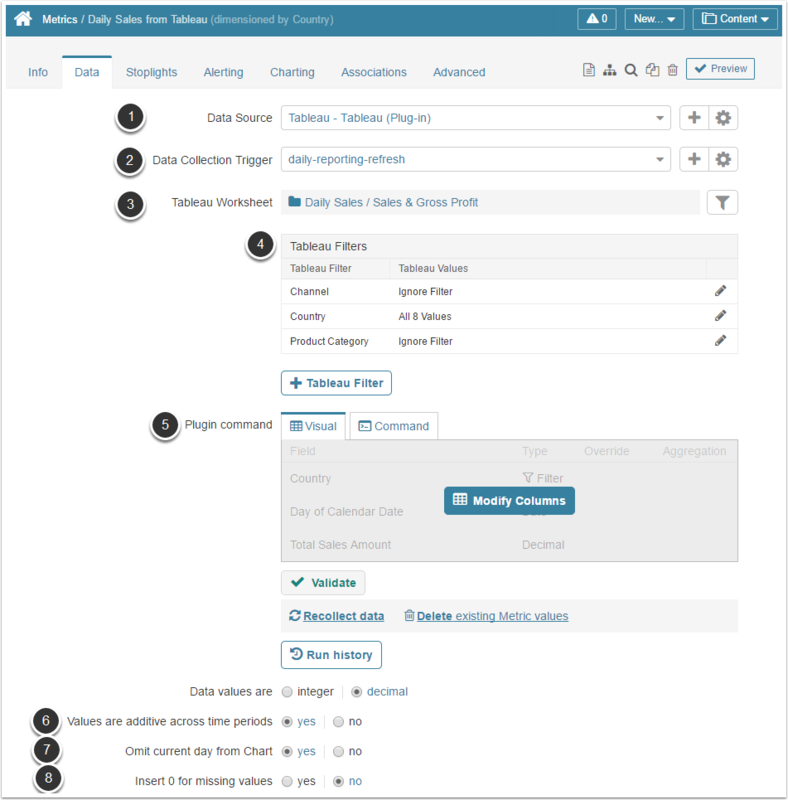 Insert 0 for missing values: if this setting is enabled and no data is found in the source upon data collection, then the missing data is replaced with a zero and a timestamp. Setting up the options in this tab activates the Statistical View in the Metric Viewer. A Stoplight is a visual indicator of how well a Metric is doing. A Metric can have an underperforming, performing, or outperforming depending on the conditions specified in this tab. The result is denoted by different background shading in the various Metric views over time. Stoplight bands are shown even if Metric is represented as a single data point. For details refer to: Define a Metric's Stoplight. Alert History: Review all Alerts that have been generated for this Metric, who are subscribed to them, their preferred delivery method and whether the alert notification was delivered to them. [Global Alert Rules] How do they work for Metrics? Alert Rules Sending this Metric: This setting allows associating Alert Rules with this Metric, meaning, when the selected Alert is generated, the image from this Metric's Chart is going to be applied to a notification. 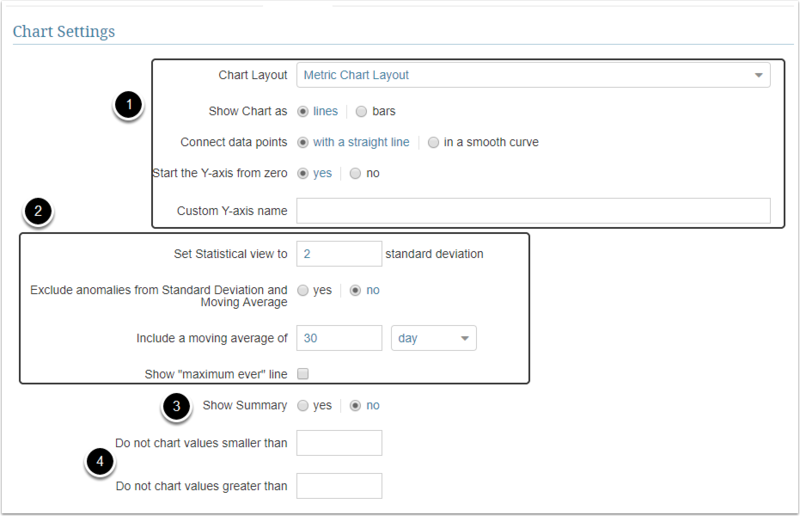 Define the Chart layout and appearance with a set of available options. Include a moving average of: select number and time period. Сurrent data point is excluded from the moving average calculation. EXAMPLE: The Moving Average for the data point on 8/1 would be based on the 30 days from 7/3 to 8/1, inclusive. The Moving Average for 8/1 would be based on the 30 days from 7/2 to 7/31, inclusive. [Optional] Select Show "maximum ever" line. Show summary: Define whether the statistics summary information should be displayed in the Metric Viewer. Chart values smaller/greater than: optionally set to exclude specific values. Override Display Mask: Metric's default Display Mask is defined at Metric Viewer > Overlay Metric (a button under the Chart) > Display Mask of Left Axis. To change the value display mask for Metric's tile only, choose another mask in this field. Units: type in the text that should be displayed above the element's current value. Show percent change from: Choose the period for calculating percent change. Default view: set the View all Users will see as a default. Linking a Metric to an enabled Target activates the Target View in the Metric Viewer. Targets allow analysis of performance related to organizational goals, such as a forecast or budget. For details refer to Targets Overview. Setting the Project future values field to 'yes', Setting up the options in this tab activates the Projection View in the Metric Viewer. Associations: Select Metrics to be included in the Measurement Interval drop box in the Viewer. Business owner: Making either a Regular or a Power User the Business Owner of any Element provides NO View Access to the element or access to its Dimension/Values (if any). Data steward: [5.4.1 version] Optional and Informational only. Used to specify User responsible for any existing regulatory or government data rules. When displayed, this field provides a "mail:to" link for specified User. Technical owner: Power User designated as the Technical Owner receives Edit Access to the element. Regular User cannot be a Technical Owner. This Metric is public/internal: If this Metric is "internal", it cannot be shared with users who have no account in Metric Insights. 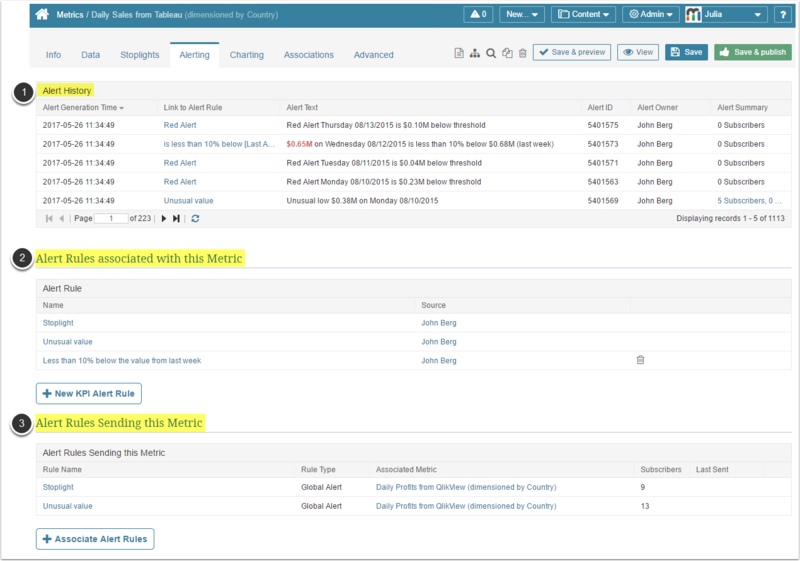 For details refer to Sharing elements with users not registered in Metric Insights. Email URL override: When a user clicks on the metric link in a digest, he can be redirected to the external portal/application. Provide a link to the page where a user should be redirected in this field. Attach file to Digest: If you choose to attach this Metric's chart and info, define a file format from the drop-down list.